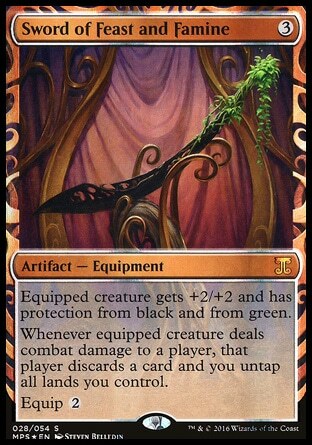 Swords, introduced in the Darksteel set, have returned in the Scars of Mirrodin block and among Kaladesh Inventions. Sword of Body and Mind and Sword of Feast and Famine proved to be extremely powerful and found a place in several decks, both in Standard and Extended, when they were first released, and are occasionally seen also in Legacy decks. We will untap our lands and we will be able to pass the turn with mana available to respond to our opponent’s actions. For decks like Faeries or U/W, it’s a significant advantage. Our opponent will discard a card; card advantage is one of the keys how to win games. These swords are also interesting from a rules point of view. Let’s see why. If part of an effect can’t be applied, the effect will do as much as possible, and the parts that can be applied will apply. If your opponent can’t discard because he has no cards in his hand, you will still untap your lands. A Phyrexian Crusader equipped and unblocked will trigger the ability. The creature has infect and its damage will cause your opponent to receive poison counters instead of losing life, but it still deals damage; infect modifies what damage does, but it doesn’t modify the fact that damage is dealt. A Mirran Crusader equipped and unblocked will trigger the ability twice. Double Strike means that the creature will deal damage twice, in two different moments; therefore, there are two trigger events. A Mirran Crusader equipped and blocked by a Squadron Hawk (for example), doesn’t trigger the ability. Even if first strike damage is sufficient to destroy the blocking creature, the Crusader is blocked and, when he tries to assign his second combat damage, there will be no creature that will be dealt damage. The situation changes if the equipped creature, in addition to double strike, has also trample. Using this last example, let’s imagine that an effect gives trample to the Mirran Crusader. He will be able to assign his first strike damage like this: one to the Squadron Hawk and three to your opponent; the ability triggers a first time. When the Crusader assigns his second damage, he’s still blocked, but there is no blocking creature and trample will allow him to assign all his damage to your opponent; the ability triggers a second time. The ability is not prevented by an effect that gives shroud to your opponent, like Leyline of Sanctity. The ability just says “player”, not “target player”. On the contrary, the ability gets prevented by an effect that prevents the damage, like Solitary Confinement. Prevention substitutes damage with “nothing happens”. If the equipped creature deals zero damage, the ability doesn’t trigger. Effects that redirect the damage, like Shining Shoal, don’t change the source of the damage. If your opponent redirects the damage to you, it’s still combat damage and the source is still the equipped creature. You will discard a card (because you are the damaged player) and you will untap your lands (because you control the ability). In addition to the triggered ability, each sword gives +2/+2 and protection from two colors to the equipped creature. It’s good to note that the protection is an ability that is granted to the creature, while the triggered ability is on the equipment itself, not granted to the creature. What happens if Ovinize is cast on the equipped creature? About power and toughness, we have “the creature is 0/1” and “the creature gets +2/+2”. The first effect applies in layer 7b (effects that set power and toughness); the second effect applies in layer 7c (effects that modify power and toughness). Layers are applied in this order, and the creature will be 2/3. The creature loses protection from the two colors (protection was an ability of the creature). The triggered ability still exists (it belongs to the equipment). What happens if we cast Volition Reins to gain control of our opponent’s equipped creature? We gain control of the creature, but not of the equipment. We cannot move the equipment onto a creature we control, while our opponent will be able to move his equipment onto one of his creatures. The sentence “you untap all lands you control” refers to the controller of the equipment. If we deal combat damage to our opponent, he will discard a card and he will untap his lands, not us. What happens if we cast Volition Reins to gain control of the equipment? We will be able to move it onto one of our creatures, while our opponent won’t be able to move it anymore. Similarly to the example above, if the equipment is still on our opponent’s creature and that creature deals combat damage to us, we will discard a card and we will untap our lands. What happens if the equipped creature deals combat damage and we forget to apply one of its effects? At tournaments with a Competitive Rule Enforcement Level (REL), or higher, according to the Penalty Guide, the infraction is called Missed Trigger. The first question is “how much time has passed?”, and the concept of time means “one turn”. IPG tell us: “If the ability was missed prior to the current phase in the previous turn, instruct the players to continue playing.” [otherwise] the opponent chooses whether the triggered ability is added to the stack. If more than a turn has passed, the ability is lost and its effects don’t happen; if less than a turn has passed, opponent chooses if the ability goes on the stack, or nothing happens. Different is the case in which we resolve the ability incorrectly, or partially, like untapping our lands but forgetting to make our opponent discarding a card. In this case, the infraction will be a Game Rule Violation. In any case, if you spot a mistake, call a judge as soon as possible: we will be there to help you!